The classical radio bandpass filter. Quality Q of coils . Example of a buck-regulator with sample + hold in the loop. DC-converter inrush current is matched to transistor second breakdown. 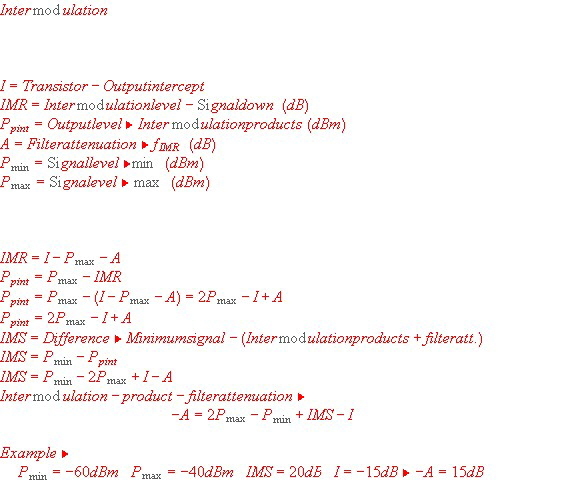 The Basics of quadripole parameters . Neutralisation of transistors using y parameters. Explanation of the Smith Chart basics. Normalized resistance and reactance circles. Summary of all impedance smith chart circles . Application using the Smith Chart. Impedance and Admittance Smith Chart. Working with the impedance / admittance Smith Chart in a graphic software. Transformers in the Smith Chart. Wave lines in the Smith Chart. The parallel resonator in the smith chart. The series resonator in the smith chart. The wave guide resonator in the smith chart. Electronic matching , using the smith chart. Matching example #1, MOSFET Output. 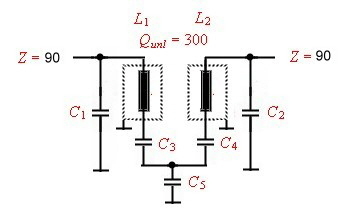 Matching example #3, component and transformer. Matching example #4, transmitter output power transistor. Matching-example #5, using only one Wave line. Matching-example #6, matching from input and from the output. Matching-example #7, several wave lines having different Z. Matching -example #8, matching with different Z and Capacitor. Matching-example #9, using parallel stubs. Matching-example #10, parallel resonator and series resonator as matching circuit. Matching-example #12, lumped LC filter as as matching circuit. Matching example #13, transistor matching using noise circles. All receiver inputs have the same problems: Selectivity, matching, noise matching and intermodulation. 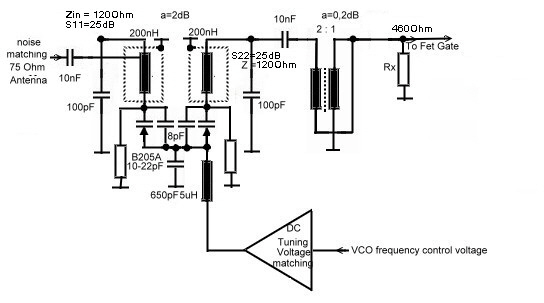 As a type for all receivers, a FM-radio input circuit is considered and new filters are shown to enhance the receivers input. The classic FM-radio input stage is a one resonator filter followed by a low noise RF-transistor. As it is well known, the input selection is low. Simple radios even have only a untuned input filter. Using this simple circuit a lot of intermodulation products are produced in the first transistor, simulating a lot of received channels . Due of this, receiving a weak radiostadion is impossible. Fig. and 2 shows the typical circuit which will be improved in the following context, to reach better selection and lower IM-products. To minimize noise ,a little power mismatch has to be made. The result of this mismatch then is again a broader bandwidth. That means realizing better selectivity would reduce the input noise too. A additional weakness of this single resonator filter is the low attention to reject strong ratio channel intermodulation-products, outside of a tuned weak radiostadion. Intermodulation products are produced in transistor amplifiers due of non linearity especially in the vicinity of saturation. 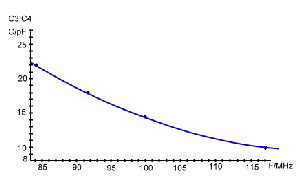 Intermodulation suppression quality is defined as level distance between the products of two carriers outside band and a tuned carrier. Fig.4 may help to explain the situation in a receiver. The two carries Pmax produce the products Pint. If there frequencies appear near the tuned frequency they my suppress the carrier Pmin. In difference to the picture of Fig.4 the reality is , that the IM-products are a hedge of products which create a big power density over the total band. It is well known, that the IM -products therefore must be 20 dB down of Pmin. This 20 db can be reached by using a proper input filter. As we can see in Fig.3, a 20 dB rejection is only reached outside the FM-band. Therefore the level of the I-products depends only on the linearity of the first transistor-stage. Due of this, the rejection of the input filter has to be enhanced. 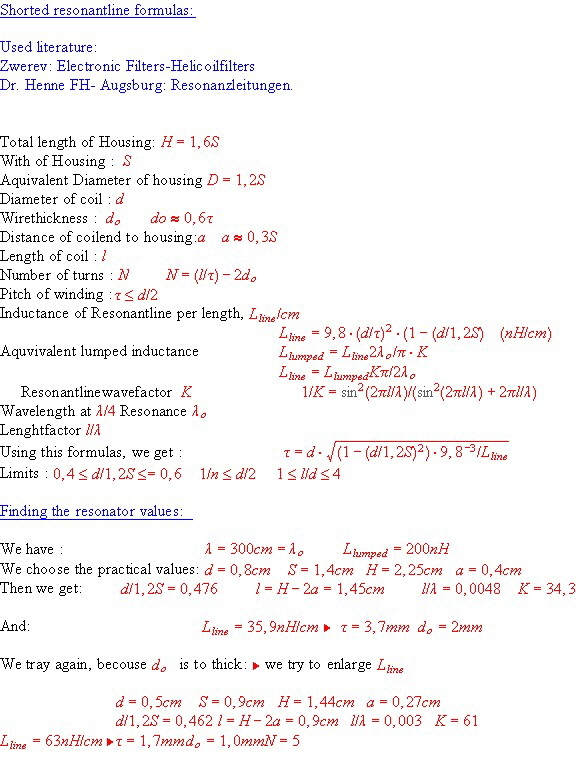 In this context, formulas are presented to compute the necessary filter rejection. In Fig.5, using a transistor with an -15dB intercept point, we find 15 dB as value for the necessary filter rejection. Since no filter is ideal having a rectangular roll-off, no filter will reach this value in the vicinity of a received channel. But each dB rejection better than the standard filter, improves the receivers quality. resonators. We use the inductance values of this resonators as lumped circuit values to be used in lumped filters.This filters are designed mechanically as SMD-PCB circuit. Look at Fig.5 where the arrangement is shown. Here we have the coil soldered on two soldering eyes surrounded from the ground of the PCB. A rectangular copper sheet housing is soldered over the coil. The other filter components are as SMD-components soldered on the other side of the PCB. The soldering points must be carefully designed to minimize parasitc C and L. The shown dimension can be computed using the following iteration on a pocket computer. In doing so, we must know, that the value of the inductance of a shorted resonator is different from the lumped value inductance. Formulas are given in Fig.6 to compute the necessary resonator values to realize the resonant line. Quarter -wave resonators have Q-values up to 2000. Using the shorted resonator only leads to Q-values up to 500, and this is the range, we need to be used for the FM-radio bandwidth. Formulas are given to find the Q of a resonator having certain dimensions. 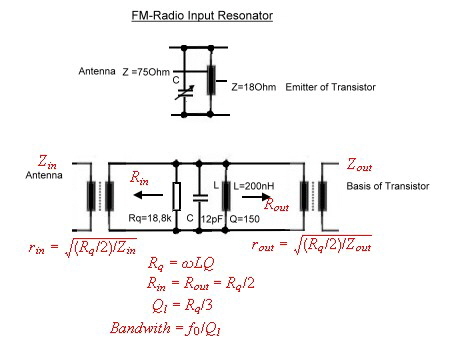 The outcome is a unloaded Q value of 350 which then leads to an loaded Resonator resistance of 14,5k and a bandwidth of 800 kHz for a single resonator, instead 2 MHz of Fig.2 .Fig.8 shows the formulas to compute the Q.The losses in the resonator are all in series as Fig.7 shows.They depend on the used skin factor of the used material. Silver or copper material is necessary to get low Q. 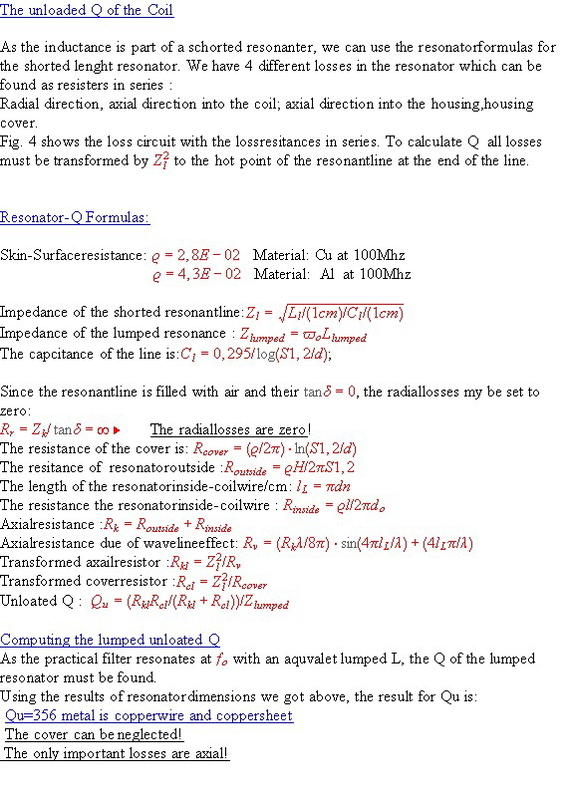 First we calculate the resistors due of skin effect and waves, after that we transform it to the hot point.The Q is then found by means of the impedance of the equivalent lumped impedance and the paralleled loss resistors on the hot point.Q = Rloss / Zlumped. A two resonator input filter. As we now are able to realize a high Q-coil, it becomes possible to realize a higher order filter in the radio input. The output of the filter must be matched either to a a 2k high-Ohm MOSFET or a 20 low-Ohm emitter input of a basis circuit . A two resonator circuit with capacitor ground coupling was used. Using this coupling, we avoid the complicated mechanical whole coupling of helicoil filter. We use two of the simple high-Q Coils which have no magnetic coupling at all, if properly covered. Fig.9 shows the basis circuit. DC-path and decoupling Capacitors for the varactors. SMD matching transformer to the FET. DC-control unit to match the varactors to the VCO overall-tuning. Fig.11 shows the finally circuit. Now we can consider the CAD-result of the filter in Fig. 13. We see two diagrams , one for the 1 resonator-filter of Fig .2 and an other of the 2 resonator-filter of Fig.9 .The narrow channel bandwidth both are the same, depending only on the loaded Q. But with the 2 resonator circuit, we have reached the goal, outsite band rejection = 15 dB at 7 Mhz distance from the tuned frequency fo. Simple receivers in the input have a untuned covering filter. The resonator of Fig.2 is shunted by means of 1k resistor to get the necessary bandwidth. It’s clear, as Fig.13 shows, the insertion loss then is very high. With little effort, we design a matching covering filter without the damping resistor and get a betters selectivity at less losses. We start with a small parametric filter, which was used as output filter in a 1 Ghz mixer. (# 1). First, the impedance has to be changed to 75 Ohm. This is done by multiplication the component values with the square of Z-ratio. (. ( # 2) The next is changing of the middle frequency by multiplication all components with the frequency factor f2 / f1. (# 3) Now we simplify the input, by using Norton’s transformation (# 4), which adds an ideal transformer. (# 5) Now we shift the transformer to the left side by multiplication the components on the left side of the transformer with square of Z-ratio. Removing the transformer gets the circuit back to the 75 Ohm impedance. (# 6). Next is to transform the coils using Norton’s transformation too. Doing so, we can remove one coil. Removing Norton’s transformer increases the output impedance into the kOhm range, just fitting to a MOSFET gate. (#) 7. The 0.7 pf output capacitor can be gate input-Capacitor. Antenna noise matching can be made changing the input capacitor. Comparing the results at Fig.13 with the classical filter shows, insertion loss is only half.